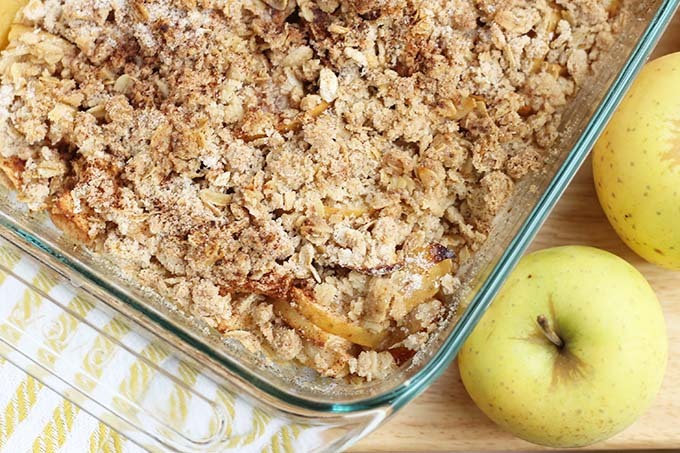 Put those fresh apples to good use in this simple and delicious Gluten Free Apple Crisp. I am a huge fan of fruit crisps because they are so much faster than pie and every bit as delicious. 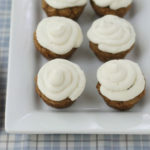 And they are an easy way to make a dessert that feeds a lot of people with minimal effort. 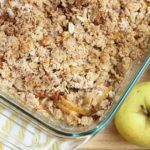 This Apple Crisp, which is made with gluten-free flour, is adaptable for dietary restrictions and is filled with fall flavors like cinnamon. It pairs really well with vanilla ice cream, whipped cream, or even yogurt if you decide (like me!) to enjoy some leftovers for breakfast. 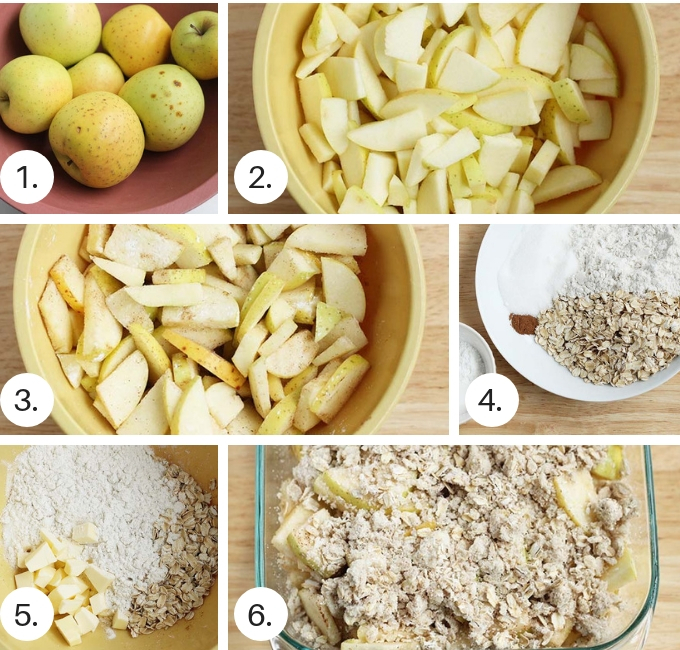 To make this Apple Crisp you’ll need: about 4-6 medium apples, cinnamon, sugar, gluten-free flour (or whole wheat flour), rolled oats, and butter. It’s very straight forward and a nice basic crisp recipe. 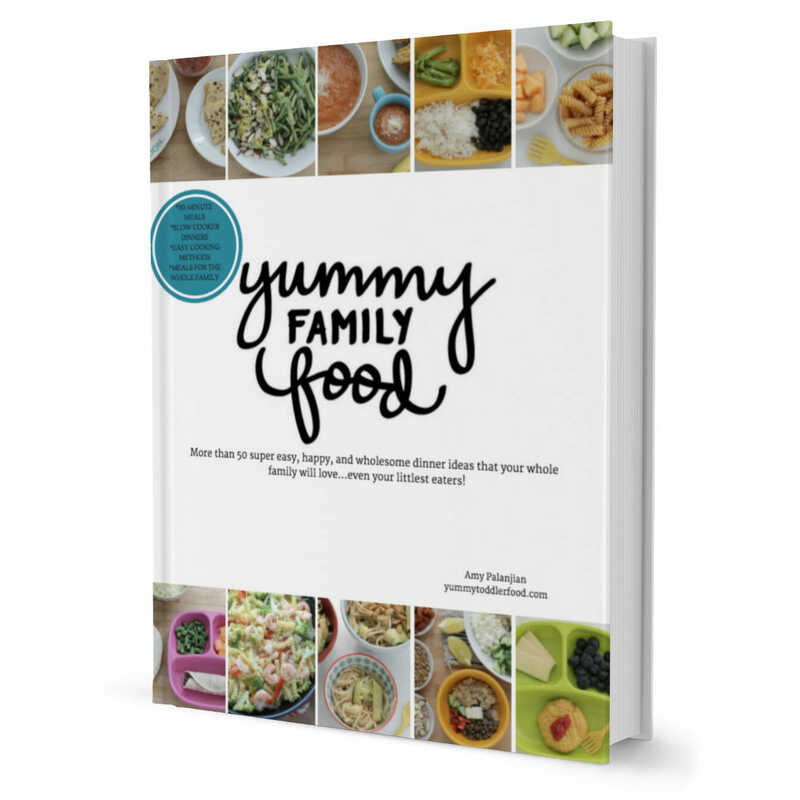 Here’s a look at the process involved in making this family dessert. Preheat the oven and coat a 2 quart glass baking dish with nonstick spray. Place the apples into a large bowl and toss with the cornstarch, cinnamon, and the lemon juice. Spread into the prepared baking dish. Place the oats, flour, sugar, vanilla, and remaining 1 teaspoon cinnamon into a medium bowl. Spread the topping over the apples in the pan. Bake! 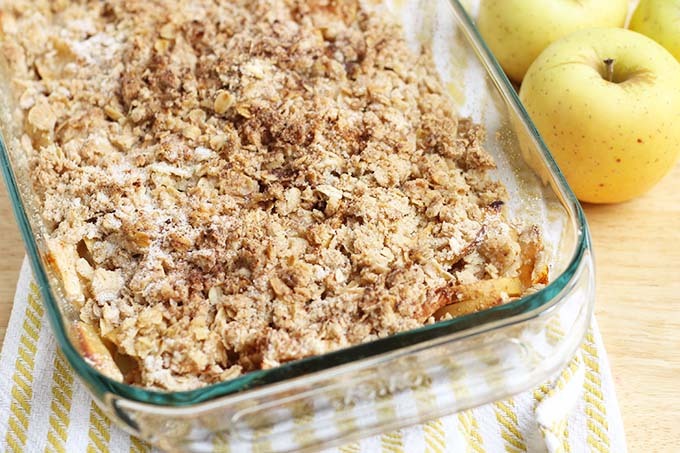 What do you like to serve with this Apple Crisp? 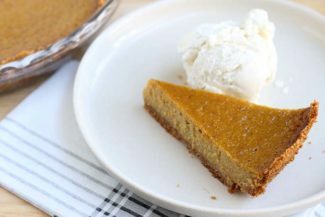 You can serve it plain, topped with ice cream or whipped cream, or even topped with coconut whipped cream or thick Greek yogurt. It’s really up to your own preferences! 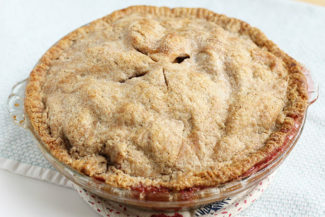 What kind of apples are best in this recipe? You can use any firm apple such as a Granny Smith or Pink Lady. I used Jonagolds from our farmer’s market which have a nice sweet-tart flavor. Can I make this Apple Crisp ahead of time? 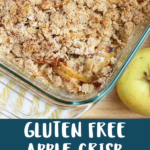 I like to make this Gluten Free Apple Crisp in a glass baking dish that can be easily stored in the fridge or freezer, because yes, you can make it ahead. 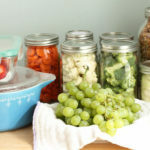 You can make it up to 3 days ahead and store it in the fridge or up to 3 months and store it, lid on or otherwise tightly covered, in the freezer. Thaw overnight in the fridge and warm through in a 300 degree oven, covered with foil. I like to use this gluten-free flour blend. 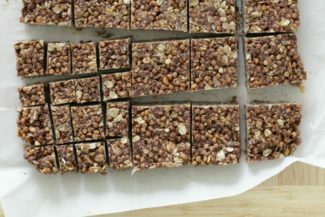 You can also make this with almond flour or whole-wheat. Preheat the oven to 400 degrees F and coat a 2 quart glass baking dish with nonstick spray. Place the apples into a large bowl and toss with the cornstarch, 1 teaspoon of the cinnamon, and the lemon juice. Spread into the prepared baking dish. Spread the topping over the apples in the pan. Bake for 30-35 minutes or until the apples are soft. If the topping starts to get too dark brown at any point, cover it loosely with a piece of foil and continue baking. Let cool slightly and serve warm or at room temperature. 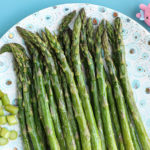 You can make this up to 3 days ahead and store it in the fridge or up to 3 months and store it, lid on or otherwise tightly covered, in the freezer. Thaw overnight in the fridge and warm through in a 300 degree oven, covered with foil.